Kick starting 2019, Ace Cafe London is delighted to be attending the forthcoming Carole Nash Irish Motorbike & Scooter Show, to be held at the prestigious RDS Dublin 1st to 3rd March 2019. This not to be missed early spring show attracts thousands of riders, checking out the new bikes, trends and gear on display in a relaxed and pleasant atmosphere . This years includes award ceremonies for the AMD International World Custom Bike Building Championship, along with the opportunity to meet heroes of road racing, and to see Barry Sheene’s Legendary Suzuki RG500 197-77 bikes. Special guest Valerie Thompson “Americas Queen of Speed” will be opening the show on Friday 1st. The outdoor arena features demonstrations and displays ranging from 1000cc sidecars, Mini-Bike, Flat Track and Moto X racing to world class stunt riding with Adam “Special” Peschel (the top European Stunt rider) and his 4-man stunt team. In addition to which, for those looking for a thrill and to hone their skill on two wheels, there is the Mattie Griffin Stunt Show and Wheelie School, that includes a stunt riding experience where show visitors can learn what it is to be a stunt rider. The Ace stand and display inside the main halls at RDS includes the Dublin debut of celebrated special guest Makoto Endo, the renowned the Japanese artist based in New York City (USA), who specialises in the painting on canvas of motorcycles with the aim “to paint the sound of the engine”. He will be working “live” on the Ace stand using only Indian ink, flung and applied by bamboo chop-sticks! 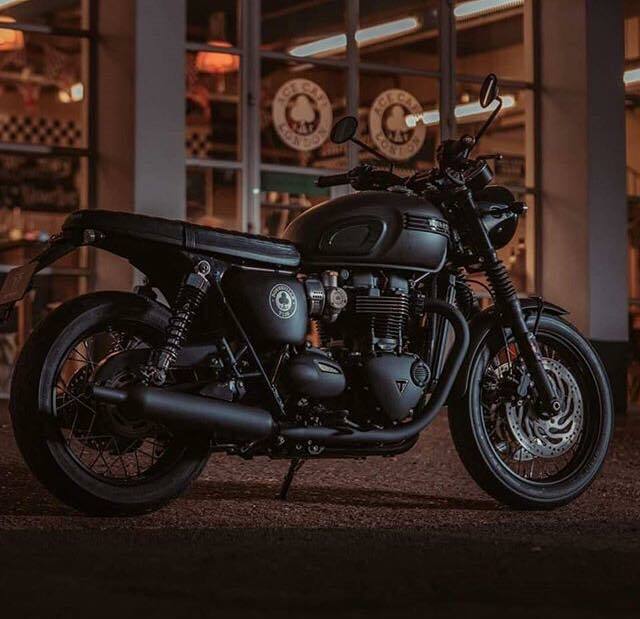 The “Ace Cafe Classic & Retro Zone” will be showcasing cafe racers, classic and vintage (including Italian & Japanese) motorcycles and scooters, with “Spirit of the Ace” awards up for grabs for the best of the “Mods & Rockers”. Along with the 59 Club celebrating 60 years since the famous registered church charity first opened in 1959, the Ace stand at the show will also include the debut of the new Limited Edition factory special Triumph Bonneville T120 Ace together with an array of Ace Cafe, Rockers, 59 Club items and the critically acclaimed 312 page definitive hard back book “Ace Times – Speed thrills and tea spills, a cafe and a culture” by author Mick Duckworth . With Mark Wilsmore being available to sign copies – stop by, say hello and try the famous Ace tea that can now be enjoyed at home by all who share the passion and enjoy the taste. Made to the cafe’s own special blend of tea from Assam and Kenya, Ace Cafe London tea bags are supplied in striking and distinctive black and white Ace 125g carton packs of 40, refreshing and perfect for any time of day. With its world renowned hospitality, and being so easy to get to, whether by cheap flight with bus connection from the city’s airport direct to the RDS venue, or by special bike show ferry deals, there couldn’t be a better excuse for a weekend in Dublin!